If you inventory my photos of Cars Land, you'll notice that Ramone's has the least showings on this blog. Truth be told, I find Ramone's to be the least photogenic of all the Cars Land structures. The symmetrical but unspectacular facade don't make for an ideal composition, and even the green and purple neon at the night are far from my preferred color combo. It's just not my thing--and yes, that's definitely subjective. But every once in a while, I'll find a perspective I like. So here, playing simply with changing the angle of the shot, I was able to snag a view that emphasizes the iconic tower signage at Ramone's House of Body Art. Now if only the area wasn't also used as a huge stroller parking area...! 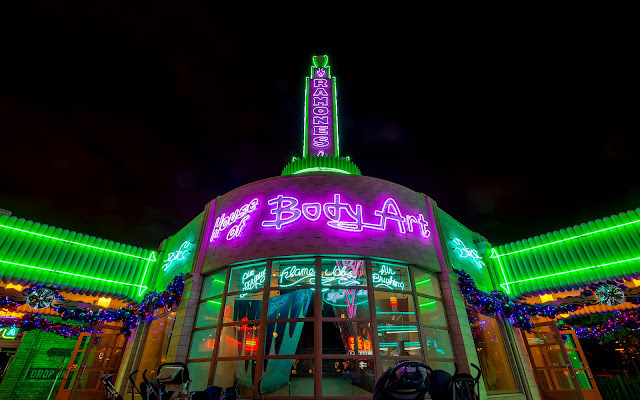 Ramone's House of Body Art also takes a subtler approach to Christmas decorations.